One click jailbreaks. Nice. Good intro to jailbreaking. 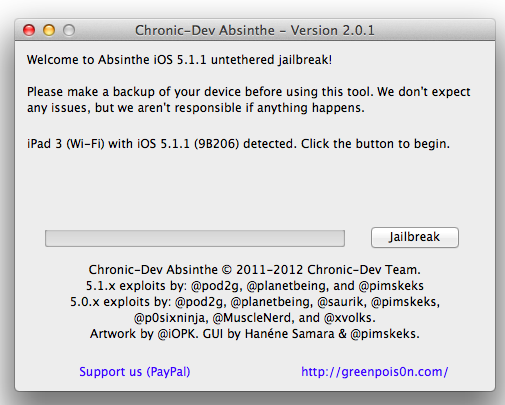 The developers behind the iPhone Dev Team and Chronic Dev, among others, released a new version of their iOS jailbreak tool, Absinthe, last Friday. But is jailbreaking iOS devices still en vogue? It certainly seems like it: the latest version, which performs an untethered jailbreak of nearly all iOS devices running iOS 5.1.1—including the iPad 3—was reportedly used to jailbreak at least 973,086 devices over the Memorial Day weekend. Jailbreaking skirts around the built-in security features of iOS, allowing users to install third-party software not approved by Apple, customize the user interface, and even access an iOS device's command line and file system. It can also enable unlocking a (GSM) device from a particular carrier for use on an alternate carrier, or using SIMs from local carriers when traveling abroad. Jailbreaking can sometimes be a difficult process because developers must often find security holes that allow the jailbreaks in the first place. Apple constantly works to plug those security holes, and many times, new versions of iOS or devices with newer processors are difficult to crack. They may also require "tethering" to a computer with jailbreak software running in order to reboot.